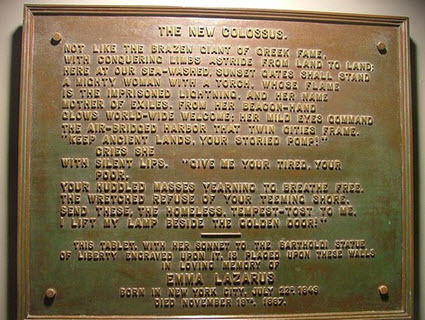 "The New Colossus" is a poem by 19th century poet Emma Lazarus. It is also known as The Statue of Liberty poem. It was written on November 2, 1883. The poem can be found on The Statue of Liberty. It is printed on a bronze plaque mounted inside the lower level of the pedestal. The Statue of Liberty - Ellis Island Foundation says the sonnet was written for an auction to raise funds for the pedestal. The bronze plaque containing the poem was added to the statue's pedestal in 1903 according to the Wikipedia entry. The "brazen giant of Greek fame" referenced in the poem is the Colossus of Rhodes, an enormous statue in that was built in 280 BC to celebrate a military victory. Lazarus's poem says the Statue of Liberty is a welcoming statue and not a statue meant to represent power. The Library of Congress has audio here of Alicia Ostriker reading the famous poem. Ostriker says in an essay, "For me, this poem’s beauty cannot be separated from my family’s history. All my grandparents came to this country in the 1880s, at just the moment that inspired the poem. They were escaping poverty and pogroms. To them as Jews, America was the land of opportunity, of hope for the hopeless. None of them ever became rich, but they survived."